Adding textures to photographs can produce very pleasing results. In part one I gave a general overview of textures, in part two we began looking at how we might add a texture as a layer in Adobe Photoshop to affect the image globally. As you progress in your use of textures you’ll probably want to be able to use your textures in a more exact way. For example, textures on skin can look awful, you may want to learn how to remove texture from just your subject’s skin. There are two ways I’m going to look at for removing textures. Through use of layer masks. Through use of a texture brush. 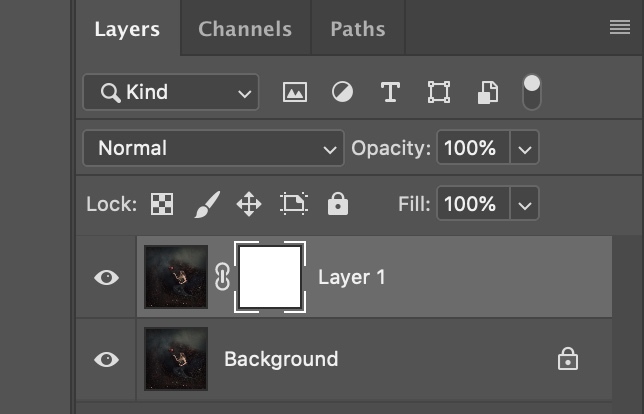 When using Layer Masks in Adobe Photoshop it is important that you make sure your foreground colour is set to white and your background colour is set to black. If you click on the two joined arrows - your foreground colour will swap to black and your background colour will now become white. Check your mask is active before you start painting with your brush. When using a white mask you need to set your foreground colour to black (and vice versa if you invert the mask). The easiest way to do this on a Mac is by pressing X. Alternatively you can click on the joined arrows above the foreground/background icon. Now you’re ready to select the brush tool to paint on the mask. If all this is new to you, then you’re best starting with a big, soft brush (hardness 0%) with a low opacity of around 40%. You can now start gently painting off the texture where you don’t want it. The whole process is shown in the video below. Layer - As in Adobe Photoshop® Layer, referring to a non-destructive editing layer which sits on top of the original background image. Globally - affects the entire image. Locally - affects selected areas of the image. Layer Mask - is applied to a layer to either reveal or conceal part of the layer. A solid white layer mask reveals the layer if your foreground colour is set to white and your background colour is set to black. You paint black on the white mask to conceal parts of the layer. Texture Brush - a brush in the brush tool menu that is made from a texture and replicates that texture wherever it is used. Invert - the direct opposite. To invert a white mask (CMD+I) would turn it black (On a Mac as you click the new mask icon press option at the same time). A black mask conceals the entire layer if your foreground colour is set to white and your background colour set to black. You would then paint with white to reveal parts of the layer. Adding Textures to Photographs - Part Four will look at making a texture brush.